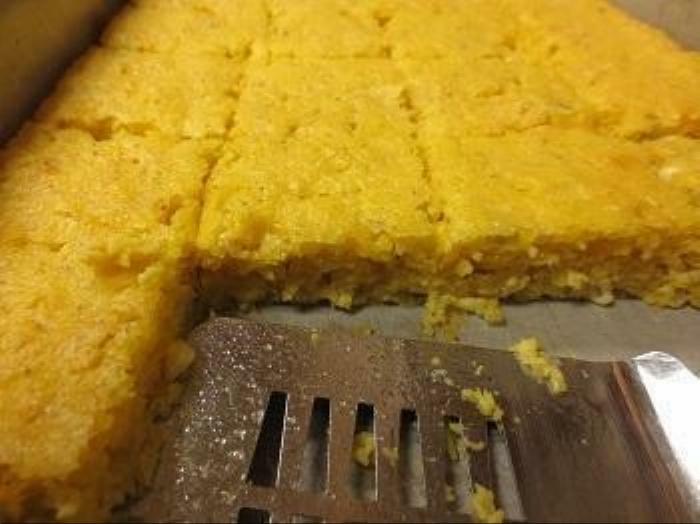 Wonderful moist, flavorful cornbread that's far removed from the awful crumbly and dry stuff that you get from regular recipes. Even gluten-free as long as you make sure that your creamed corn doesn't have the dreaded "modified food starch." Doesn't need butter, although that's always good! Best straight out of the oven, if you can manage that. 2Beat the eggs, then beat in the rest of the wet ingredients. including the corn kernels; a hand mixer works well. Mix together the dry ingredients, beat those into the wet ones, then stir in the cheese and chiles. Pour batter into pan, spread it out evenly, and bake for about 1/2 hour or until golden on top and firm in the middle. Serve immediately if possible, or reheat just before serving, or keep warm on an electric serving tray. *If you can find the small 8.25-oz. cans of creamed corn, use that. Otherwise, you'll end up using just part of a 14.75-oz. can, and what are you going to do with the rest? **I always have a bag of frozen corn on hand. The small white-kernel corn is the sweetest and freshest-tasting, I think. ***Yellow stone-ground cornmeal works best, but any type is fine. ****You can use jalapenos instead, either fresh or pickled, if you want a stronger flavor.